Most sound engineers live in anonymity like the Wizard of Oz. They’re great, powerful and unknown. No one pays attention to the man behind the rhythm. But that’s not where Shane Newville was meant to stay. With the emergence of Formless, the mix master pulls away the curtain to reveal a treasure that he kept for years. This trip-hop, electronica project unveils the hidden talents of one of Syntax Records’ secret weapons. From the beginning, he was destined for the big leagues. Pretty soon, Shane picked up the instruments that were lying around and taught himself how to play. Armed with the influences of The Prodigy, The Chemical Brothers, and a touch of classic rock, he was more than ready to get his first drum machine. So in 1995, this Michigan teenager devoured everything that he could about sampling and making beats. The basic elements of urban music became his life, and he studied all the greats of the underground. In fact, he still remembers the first time he heard of Syntax Records. Shane found an email address for the band and dropped them a line. The communication began, and he knew that one day he’d call the label his home. He says, “I loved what Syntax was doing back then. I saw them and I wanted to be a part of that. I told them, ‘I’m gonna work with you guys some day.’” But he still had a ways to go. He started from the ground up… literally. Shane joined the Syntax Records street team and handed out promotional material in his hometown. He also took advantage of the open door by passing along his beats. At SAE Institute, he learned from the best about mixing and engineering. The same week he graduated, a spot at Syntax opened up. Now a newlywed husband, Shane and his wife moved to San Diego and joined the group of renegade rappers. Shane has become the go-to guy at Syntax. He mixed and edited for many of the artists on the label. He also worked on special projects for top acts like Marcos from P.O.D. In the mean time, Shane made beats that got him featured on the infamous Night Owls 3 compilation as well as several films such as Stephen Baldwin’s skate video Livin’ It: LA, Quest for the Code (a documentary based on The Da Vinci Code) as well as cable extreme sports and music channel Fuel TV. Most recently Shane’s music was used for a new Panasonic Camcorder TV Commercial airing on NBC and other major networks. 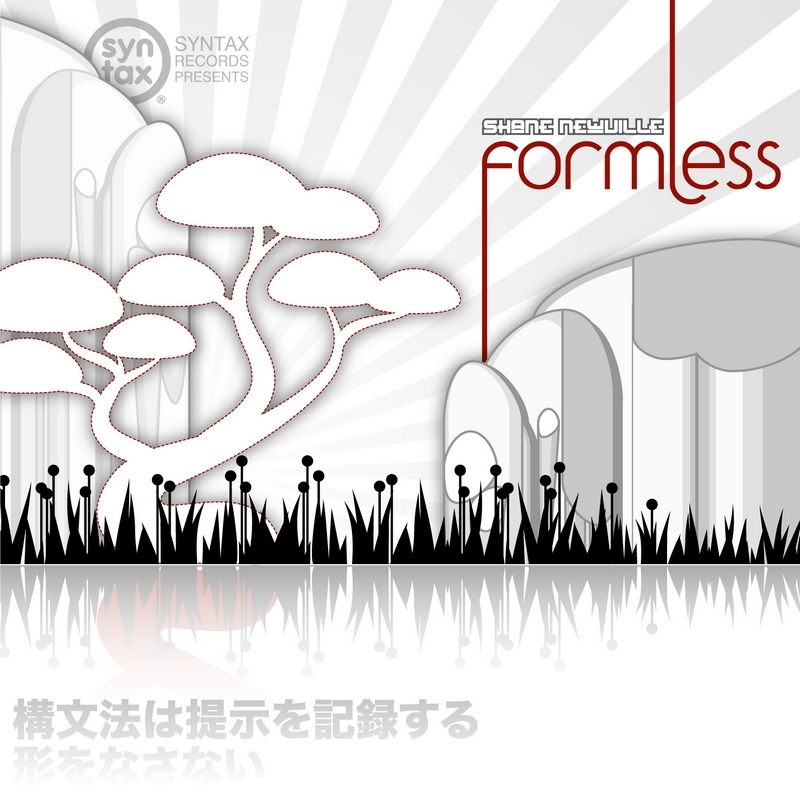 Now after being behind the music, Shane steps out with the demo that got him signed – Formless. Stripped of the typical hip-hop bravado, this project is pure break beats and digital energy. Not one second was changed on this rare project from its original format as the demo that got him signed. On every track, he spins out tricks and treats to create a masterpiece all his own. You’ve never heard anything so sharp and so moving. You’ll be warped into a techno-tronic high-speed chase on “Unseen Supernatural War”, yet the haunting melody of “Beautiful and Perfect” plays like a soothing ocean washing up and down the shore. His wife provides the enchanting voice on “Samurai Showdown”, and the intoxicating “Searching” bears the subtle marks of a professional seasoned beyond his years. From the street team to the studio, Shane Newville is more than just the mix master. He’s a visionary who can see through the mundane to produce a world of trip-hop rhythm and soul… And he does it all for the glory of One.